Thank you for the invitation to participate in this memorial for Terry today. I am deeply honoured to be included as part of this gathering. 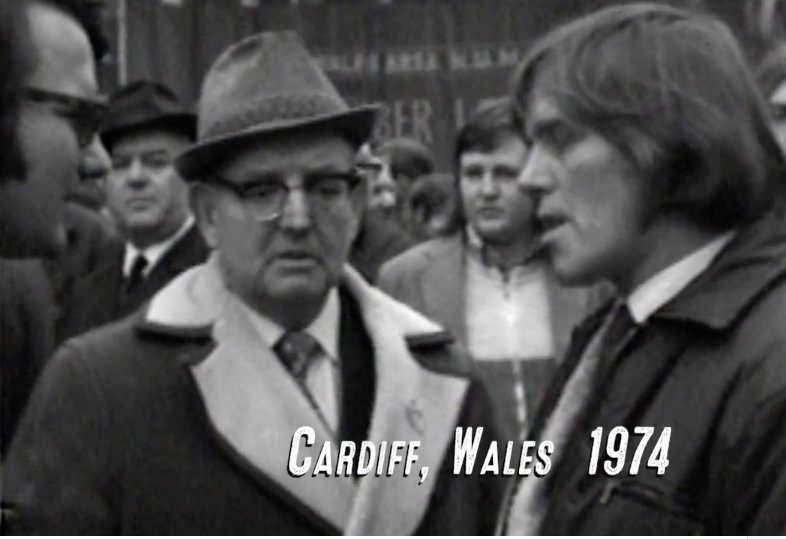 John Gaventa interviews Terry Thomas at a miners’ march in 1974. I first met Terry in 1974, when as a young American student at Oxford University, I came to the Welsh valleys to make recordings with Welsh miners to share in turn with miners in the Appalachian coalfields in America, using the then fairly new media of videotape. In both places this period was an important time: in Kentucky miners were engaged in the now famous Harlan County, USA strike – later the subject of an award winning film – and here of course, there was the 1974 miners’ strike, to which earlier speakers have referred. That initial exchange, facilitated by Hywel Francis and the South Wales Miners library, led to a relationship between miners in America and those in Wales which continues to this day. The story of this 40-year exchange between the Welsh and Appalachian Valleys was documented recently in the film After Coal. In that film, Terry plays an important role, first shown sharing his stories and insights with me in 1974 in marches and in the miners’ library, and later shown visiting Harlan County to talk about the changes in the valleys following the closure of the pits in both places. Terry was one of the first miners whom I met when I first came in Wales 43 years ago, and I saw him often in years following. Though we lost touch in later years, he continued to always welcome and support American visitors to Wales, and to be a leading ambassador of this important exchange. I learned a great deal from Terry, and others whom I met through him. Let me share at least three principles which I saw exemplified in Terry’s life – principles that continue to endure and to inspire. 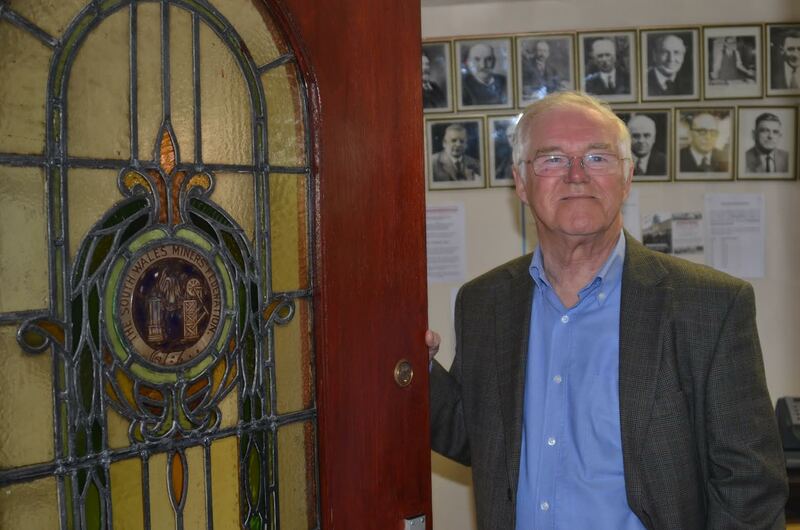 Terry Thomas at the headquarters of the South Wales Area NUM in Pontypiydd. Terry was a working class man committed to education of others. I considered myself one his pupils. When I came to the Valleys in 1974, as a young American student, I was virtually ignorant of the rich history of Wales, and in particular its mining and labour history of which Terry was a part. The first time I met Terry was in Clydach Miners Club at the height of the 1974 miners’ strike. Terry and a few miners agreed to come away from their evening with other colleagues to a small room upstairs, where I asked naively, and in typical outsider fashion: ‘Tell me, what led up to this strike?’ Forty five minutes later the Chair, Evan John, was still lecturing me on Welsh history and we had only had only made it to 1947! But Terry never seemed to mind my questions. Highly articulate and deeply knowledgeable, he always was willing to explain, to educate and to share, whether at the Miners Library, in the miner’s pubs, or on the picket line, Through him, as well through Hywel and others, I learned of the power of miners’ education, as a critical part of Welsh and working class history and culture, and as a force for social change and for social justice. Through sharing his knowledge with others, Terry also helped to inspire others. Secondly, from Terry and others I also learned of the power of international solidarity. Within Wales, I learned of the long history of solidarity by the miners and others for social justice, whether that be in the struggles for liberation in Spain, or South Africa, or the links with Paul Robeson and the civil rights movement in America. In sharing his knowledge on video, in hosting countless visitors from American mining communities over the years, and even in taking time to share his stories in the After Coal film, Terry also lived the values of solidarity, comradeship and generosity to others. In a world today of rising isolationism, of loss of compassion for others, these values of solidarity and support – regardless of nationality – remain enduring legacies of Terry and those around him. Looking forward in the struggle for social justice. Throughout Terry’s life, from miner to NUM leader, to life after the pits closed, Terry always looked forward. He knew that his principles and values – while always constant – would also mean different forms of action and leadership in different points of time. In the 70’s it was a struggle for justice in the coal mines; forty years later it was a struggle of justice for the communities who now faced the challenge life after coal. In a rapidly changing world, where we must all look to the new challenges of social justice, he never gave up hope and the belief that if communities came together, the world could be a better place. These traits too are ones which will continue to inspire. The filmmakers have sent some short clips from those early 1974 videos, and from the After Coal documentary made some 41 years later. Let’s listen for a few minutes to Terry’s words.